Purdey (who is relaxing after her supper) has asked me to publish this photo in time for Hallowe’en. Be warned that it is not for the faint-hearted or easily suggestible. 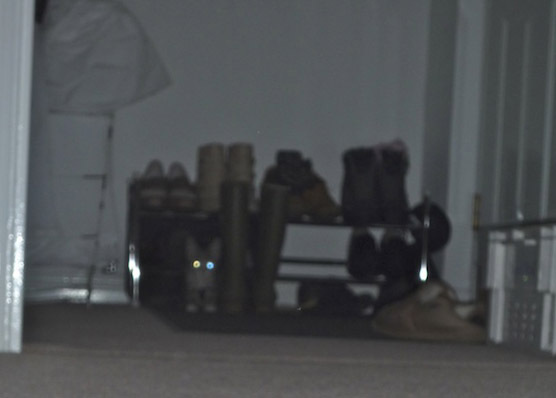 The photo was taken one evening in the dark hallway of our house, and it appears to show supernatural activity underneath our shoe rack. I can guarantee that the image has not been tampered with in any way. The winner of Purdey’s PAWS Awards… and introducing Clyde! Purdey's PAWS Awards 2017 – the Results! Question, how come the cats eyes seem to be different colours ie that on the left has a glow of yellow at that on the right a bluish glow. I have absolutely no idea! I have wondered that myself. Welcome to Purdey’s mysterious world of the unexplained!